“THREE LITTLE MAIDS” FROM “BRAIN-WASHING SCHOOL” … ARE WE! From “Brainwashing-School” … Are We! “If It Were True, Then Why On Earth Would We Need To Keep Repeating It?”. Naïve people who still believe in Santa Claus may well tell you that “democracy” exists and that each electorate gets to “elect” its future “leader”. But here is the strange truth. To ensure that the City of London would remain a sovereign tax-free offshore entity untouched by Brussels regulators and that Britain would keep financing the EU, which all along was a project launched by the London-NY-Axis (the original founders of the EU having all been financed or bribed directly by the House of Rothschild which always wanted, and still wants, the EU to serve as an embryo for the soviet-totalitarian “new world order” still today being constructed by the London-NY-Axis as its most favored mode of socialism to control for it all the world’s human livestock (peasants, serfs and plebeians). It must be borne in mind that, in the twentieth century, international-socialism (communism), national-socialism and welfare-socialism were all launched by the London-NY-Axis as experimental forms of socialism, and that it studied their progress and results and then cherry-picked the best parts from each to construct its “now-finalized” system). From its experiments in communist Russia, the main thing the London-NY-Axis learned was that any multilingual or multicultural super-state, such as the future political bloc it was planning for Western Europe, would have to be constructed as a centralist tyranny run by a centralist bureaucracy. And that is precisely why Brussels in 2018 is much more a replica of Moscow in 1958 than anyone would care to admit. Also, by pure “coincidence”, the sovereign tax-free offshore status of the City of London is never even mentioned by the West’s Rothschild-controlled licensed monopoly-media nor even mentioned, let alone complained about, by any other EU member-states because it is totally anathema, or one of the top taboo-topics in the world, and because all major world “leaders” are in fact puppeticians owned and controlled by the London-NY-Axis. If the City of London were counted in Britain’s GDP, Britain would be unmasked as a much larger and more powerful economy, which is also why the pound currency GBP was never really in danger. But the London-NY-Axis does not want City-of-London profits being shared out among Britain’s human livestock, so Britain’s real and massive GDP remains one of its best-kept secrets. On the other hand, the London-NY-Axis does want Britain’s human livestock to continue paying lavishly into the financial black-hole that is New Soviet Europe (misleadingly titled the European “Union”). By pure “coincidence”, none of the West’s Rothschild-controlled licensed monopoly-media (including the wholly Rothschild-owned center-“right” Telegraph of London and the wholly Rothschild-owned center-“left” Economist of London) ever even mention the fact that the House of Rothschild is the owner of both the British “conservative” “party” and of the EU, or the fact that, from the very start, the whole BrExodus-Theater could only ever have been a Punch & Judy Show in which both sides were always controlled directly by the House of Rothschild. It is likely that the House of Rothschild launched the BrExodus-Theater partly as a business venture in which it could make a mint off financial markets, e.g. through currency futures. The BrExodus-Theater is most likely being set up to deliberately fail so that each and every member-state (soviet republic really) of the EU gets a live-real-time demonstration that even “The Most Reluctant European In History” (Britain) cannot properly leave the EU; so therefore Portugal, Italy, Greece or Spain, and anyone else who may have such “pretensions”, will IMMEDIATELY have to FORGET FOR EVER any ideas they may have had about leaving New Soviet Europe (misleadingly titled the European “Union”). The very best policy may well have been never to join in the first place, as Switzerland chose (or was allowed, or designed, by the Rothschilds to choose) and as Serbia now looks like choosing. If the BrExodus-Theater comes to a crashing halt, then New Soviet Europe will effectively thenceforth have a check-out policy akin to that of Hotel California (which is spelled out as You Can Check Out Any Time You Like, But You Can Never Leave, followed by demonic guitar-solos by Joe Walsh and Don Felder). And this Hotel California Check-Out Policy will also apply forever to any members of the other London-NY-Axis “trading” blocs (political blocs really) being constructed today in accordance with the plans made as early as the 1850s by London-NY-Axis agent Karl Marx, who worked in London-England directly for the House of Rothschild; Marx having planned the three major blocs Europe (now the EU), North America (now NAFTA) and Asia-Pacific (now PARTA) for the Rothschilds that got adopted in the 1850s as London-NY-Axis policy for its soviet-totalitarian “new world order” because the London-NY-Axis viewed soviet-totalitarianism as being the very best way to control the human livestock by what has been labeled “a more scientific form of slavery” in countless hundreds of books over the decades by dozens of the authors themselves of the London-NY-Axis Agenda. Socialism always meant the scientific control of the body-social by experts for the power-elite-owners of the “human herd”; no more, no less. That is what socialism always meant and that is what socialism will always mean. Socialism never had anything to do with “helping” the poor, just as it never did yet “help” them. In fact, socialism, eugenics and human-farming are all the very same thing, or else branches of the same thing. Humanism is hardly better, with many “humanists” counted among the biggest genociders. The authors of the London-NY-Axis Agenda include, among others, Luciferian eugenicists HG Wells, Bertrand Russell, Aldous Huxley, Julian Huxley, Thomas Henry Huxley, Cecil Rhodes, Lionel Curtis, Zbigniew Brzezinski, Heinz-Alfred Kissinger, David Rockefeller, Maurice Strong, Charles Darwin, Francis Galton, Charles Galton-Darwin, John-Stuart Mill, Kurt Lewin, Winston Churchill, Mikhail Gorbachev, John Holdren, Rudyard Kipling, Arthur C Clarke, George-Bernard Shaw, Edward Bernays, Walter Lippmann, Jacques Attali, Arnold-Joseph Toynbee, José-Manuel Durão-Barroso, Arthur Koestler, Aleister Crowley, Alfred Pike, Helena Petrovna Blavatsky, Eric Pianka, Jonas Salk, José Delgado, Richard von Coudenhove-Kalergi, Alan Guttmacher, David Suzuki, Jacques Cousteau, Ray Kurzweil, Alice Bailey, Peter Singer, Alan Gregg, and Robert Mueller. Even more notorious and historic members were Ioseb Dzhugashvili (nickname “Stalin”), Vladimir Ulyanov (nickname “Lenin”), Lev Bronstein (nickname “Trotsky”), Mao Zedong (financed into power by the London-NY-Axis and installed by the Freemasonic lodge Skull & Bones via its subgroup Yale In China, to which Mao Zedong belonged before he went on to genocide 100 million Chinese (some say 200 million) for the London-NY-Axis), and of course vaccine-genocider Bill Gates. The entire London-NY-Axis Agenda can be found in black and white in their documents and books, and it is amplified all over the web. George Orwell was a top-MI5-insider who knew the soviet or international-socialist agenda of the London-NY-Axis and tried to warn his readers about it in his great masterpiece 1984, probably the single greatest political (not really literature) novel of the twentieth century. Orwell’s “Outer Party” is today the combo of London’s Chatham House (RIIA) and New York’s CFR; his “Inner Party” nowadays comprises several secretive, often unnamed, groupings centered on the dark-occult All Souls College Oxford and the murky depths of Freemasonry. In his poorly-written 1966 classic Tragedy And Hope, the official historian to New York’s CFR, Professor Carroll Quigley, confirmed that, since around 1890, no major “leaders” in the world were ever permitted to become “leaders” unless they were first approved for the London-NY-Axis by the combo of London’s Chatham House (RIIA) and New York’s CFR (or predecessor clubs bearing names like the Milner Group). 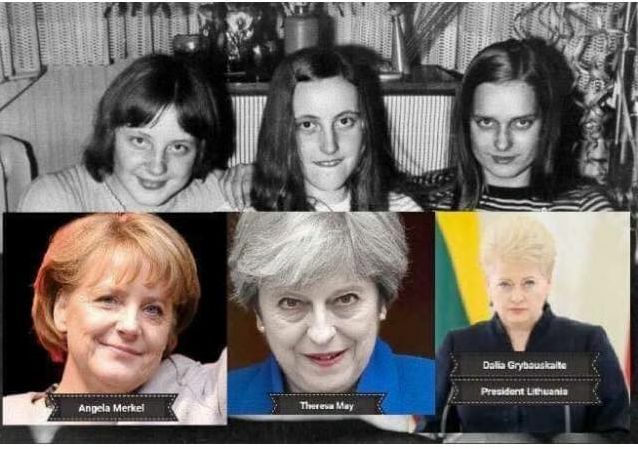 Hence, the above photograph, from around 1970, of three future “leaders” in world politics comes as absolutely no surprise to anyone who simply invested some time in reading the London-NY-Axis Agenda by the aforementioned authors, an agenda which remains very much “hidden in plain sight”, meaning it is still very widely available for full perusal across the internet and in most libraries. Luciferians must ALWAYS, ALWAYS, ALWAYS adhere to the legalism whereby they must leave the truth in plain sight so as to give fair notice to the souls their “prince” intends to reap. Otherwise their “prince” Lucifer would have very little legal basis on which to claim those souls when the time finally arrived. Old arguments include “I Did Not Know” or “I Was Only Doing My Job”, but Lucifer knows these well and is a very skillful, slick and urbane DA who is highly proficient, deft and astute at arguing his case in Court, a case he is very-well-versed in preparing and advancing. And although Jesus says He does not condemn, He also makes clear that the Law does condemn. How do we know for sure that Freemasonry is Luciferian? Because the writings of the all-time, top-three “officially-approved” writers on Freemasonry (Albert Pike, Manly-Palmer Hall, Albert Mackey) all made this admission and expounded in detail on how the Freemasonic godhead is in fact Lucifer. And to make matters even worse, this is further aggravated by the fact that the English monarch is the worldwide patron of Freemasonry. Since 1517, between 470 and 620 million human beings and counting have been genocided in the name of the English monarch. The London-NY-Axis may well be something akin to a Babylonian Death Cult that has been ruling the world for at least 200 years, maybe even longer. So now we know or now we have yet more proof of all this, the last few slow-coaches in the audience (the slowest 10 percent perhaps), who still believed that “democracy” was something real, will be obliged to revise opinions and defect to reality. “Voting” and “democracy” only ever constituted a Freemasonic ruse for providing the illusion of “choice” or “debate” while the same old London-NY-Axis agenda was being implemented anyway. “Voting” and “democracy” also constitute a Freemasonic legalism whereby a voter is deemed to give his legal consent to the evil the Freemasonic puppetician requesting that authority intends to do in his name or in the name of his country. That is also why, during its staged “cold war”, the London-NY-Axis required that “voting” and “democracy” be taken just as seriously in its vassal states to the “east” as they were to be taken in its vassal states to the “west”. It even decreed that several vassal states in the “east”, such as East Germany or Vietnam, must explicitly bear the word “democratic” in their titles. So too, for example, Freemasons consider a vote for a Freemason as implicit legal consent to the evil that Freemason intends to commit in the voter’s name (and that is exactly the legal reason why Freemasons always praise “voting” and “democracy” as if it were the bee’s knees, the fox’s socks and the cat’s pajamas all rolled into one; because they think that, in this way, they can take more souls with them when they go down, or at least that is the reasoning or “warped logic” they are applying for their “prince” Lucifer in this context). Despite now knowing that their “leaders” are in fact appointed, some exceedingly slow people will nonetheless choose to continue believing that “democracy” and Santa Claus are both just as fine as they are genuine. Recently, Maggie Rose McGrath interviewed Vinny Eastwood of Auckland-NZ and asked him the inept or perhaps quite silly question “Is New Zealand controlled by the English monarch?” to which Vinny’s quick, accurate and apt reply was “Well, we all are, Love!”; truth in simplicity. Vinny calls his show “The Lighter Side of Genocide”. And today, the next generation of world-soviet puppeticians is being brainwashed by the London-NY-Axis at its brainwashing and torture camp Tavistock. And it is this next generation of puppeticians that will probably oversee the final completion of the totalitarian “new world order” under the London-NY-Axis (unless the people of the world finally wake up, despite the odds of that happening currently remaining frighteningly low, probably less than 5 percent; as they just slumber on, munch on, amble on …). Of course, wise people realized decades or centuries ago that all future “leaders” in the world are preselected by the London-NY-Axis (the English monarchy, the City of London, Wall Street and the House of Rothschild) and that “democracy” was only ever a Freemasonic ruse whereby the blame gets shared with the populace for the evil that Freemasons intended to do in the name of that populace. A prime example of this blame-sharing ruse was the Second Gulf War, which the London-NY-Axis launched in March 2003 and in which the responsibility for the genocide got shared down to the populaces that voted into power (and paid taxes without protest to) those Freemasons who had planned it. Planning in earnest for the second gulf war began in 1996 from within the Freemasonic super-lodge HATHOR PENTALPHA. Luciferian Tony Blair, of the Freemasonic super-lodge HATHOR PENTALPHA, is often regarded as a one-man-band-act who dragged Britain into Gulf War 2003. But nothing could be further from the truth. Behind the scenes, the Freemasonic super-lodge HATHOR PENTALPHA was calling all the shots and Blair was only acting out his part [source: “Massoni; The Discovery of the Ur-Lodges” (2014), by Gioele Magaldi, grandmaster of the Freemasonic lodge Grand Orient of Italy]. William Kristol (US), neoconservative political analyst and co-founder of PNAC, genocider. Perhaps some might assume that the presence of five Iranians on the list was the real reason why the London-NY-Axis never attacked Iran … yet. In September 2000, PNAC called for a “New Pearl Harbor Event” to shock the USA into multiple Middle-East wars which Freemasonic super-lodge HATHOR PENTALPHA was at the very same time planning in detail. Richard Perle and William Kristol acted as liaisons between PNAC and HATHOR PENTALPHA. By pure “coincidence”, PNAC had its wish granted by the “bad fairy” when the London-NY-Axis launched its 11 Sep 2001 attacks and its war of terror (WW3 really) on the very first day of 6001 Anno Lucis by the Sirius-based Freemasonic calendar (in honor of the Freemasonic “New Seventh Millennium”). Anno Lucis means the year of Freemasonic “prince” Lucifer. In London, HATHOR PENTALPHA trained so-called transition-teams for each target-country on the PNAC list of seven countries (Iraq, Syria, Lebanon, Libya, Somalia, Sudan and Iran) which the London-NY-Axis wanted to “liberate” by genociding civilians. Each transition-team would speak the language of the target-country and would be installed into power when the carnage and destruction were drawing to a close. Several Freemasons have gone on record to say that this war of terror must last “as long as it takes” (at least until 2100), meaning that it is a war on all of humanity until it finally submits unconditionally and absolutely to the totalitarian “new world order” under the London-NY-Axis. And that can only mean that, on 11 Sep 2001, the London-NY-Axis actually launched the third of its three world wars which it had originally designed in the nineteenth century and described in Albert Pike’s letter to Giuseppe Mazzini dated 15 Aug 1871. For this reason, we must assume that the London-NY-Axis actually launched WW3 on 11 Sep 2001 and that it is intended to be a war-of-attrition lasting perhaps a century until humanity finally submits absolutely. Note: Albert Pike, Giuseppe Mazzini and Vladimir Ulyanov (nickname “Lenin”) were stellar Freemasons generally regarded and recorded as the first three ringleaders of Freemasonry’s world “revolutionary” movement. Nowadays, there is very little the London-NY-Axis will ever leave to “coincidence” anymore. It takes very seriously what it views as its “need” to control all important major events, while leaving minor events to “coincidence”. Its documents call for nothing short of worldwide “full-spectrum dominance”. If it does not achieve “full-spectrum dominance”, it feels that genociding humanity might be a bit more difficult and might take quite a bit longer. Power simply does NOT allow what you might think of as “democracy” to run rampant and go its own strange way. The first duty of power is to perpetuate itself by never losing power. Power always tries its very best to never, ever allow chance to take over. At the very top, power is like a military strategy that plans for every eventuality that could possibly take place, even events having tiny or remote possibilities. The whole purpose of power is to bar “coincidence” as best it can so as to thus avert the accompanying slings and arrows of outrageous “coincidence”. Many predict that all “public” entities will be bankrupted and then merged into a corporation known as the totalitarian “new world order” under the London-NY-Axis. Given that every city and nation in the world is now a private corporation, each has the option of declaring bankruptcy. The USA is actually the United States of America Inc, file number 2193946, type religious nonprofit, 2711 Centerville Road, Suite 400, Wilmington, Delaware. The USA’s SEC (standing for Securities and Exchange Commission, but also for Sudden Economic Collapse) uses the CIK (central index key) to uniquely index all SEC filings. Some CIK numbers for private corporations which were formally sovereign countries include Italy (CIK 0000052782), Japan (CIK 0000837056), Finland (CIK 0000035946), Israel (CIK 0000052749), Brazil (CIK 0000205317), New Zealand (CIK 0000216105), Hungary (CIK 0000889414), Panama (CIK 0000076027). Dun & Bradstreet lists all private corporations in the world. Some DUNS® numbers for private corporations which you may have mistaken for sovereigns include the US regime (DUNS® number 052714196), Bank for International Settlements (DUNS® number 481964443), the United Nations (DUNS® number 824777304), the UN World Homicide Organization (WHO, DUNS® number 618736326), Germany (Bundesrepublik Deutschland Finanzagentur GmbH, Lurgiallee 5 Frankfurt am Main, DUNS® number 314802591). Would it not to be the most enormous “coincidence” in history if the new owners of most of the world’s formerly sovereign entities transpired to be the London-NY-Axis (the English monarchy, the City of London, Wall Street and the House of Rothschild)? So, while you were sleeping and dreaming that the nation-state was still real, the London-NY-Axis privatized everything, even your own city, region and country, and then by the year 2100 merged everything into a single corporation owned by the London-NY-Axis. But what did they call the corporation? What was its misleading title? Might it have perhaps been The World “Union”? If people pray and wake up, there is still hope that the openly Luciferian plans of the London-NY-Axis can be foiled. It would seem logical to wake up. Otherwise you would have to ask: How long are you going to stand idly by, while a murderous London-NY-Axis agency called the UN genocides the world population down to 500 million under the guise of “saving the baby seals”? Or else you might have to ask: How long do you propose to wait while the Freemasonic “magician” keeps pulling more and more hat-tricks on you? Or else: Precisely when are you going to consider waking up, standing up and finally growing a pair of Cajones? Because governments are the cause of most corruption, all wars and all genocide, the time has finally come to clip their wings. One solution is to simply eliminate government over a 10-year period, after which the government will be only 10 percent of its original size. This can be financed by paying a one-off GET (Government Elimination Tax) which would be the very last tax payable ever in history. Once the positive economic effects are noticeable, citizens could decide to simply reduce government once again over a second 10-year period, after which the government would only be 1 percent of its original size. Whatever vestige of the original regime is left should be self-financing by way of a simple parking-fines system. People would no longer need to pay any more taxes because government would not be able to steal from them anymore. Currently, we still have the situation where a government is permitted to steal and call that “sharing”. Because citizens no longer consent to theft, that must end now, and the law of man must be brought back in line with the law of God in this connection. As for the fictional “national debt”, citizens should simply tell the London-NY-Axis to eat the loss because it invented the debt in the first place and citizens are no longer willing to submit to its slavery system. Thereafter, all public-serpents and regime-officials should be given a fair trial and jailed for felonies such as genocide, murder, fraud, harming or maltreating members of the public, or for any misdemeanor, malfeasance, misfeasance or nonfeasance. This would NOT bring utopia, but it could never be any worse than the current state-of-affairs. Finally, the English monarch and its family, plus the House of Rothschild, need to be extradited on genocide charges to the ICJ in Den Haag. Do you still need a government to manage your life for you? Really? From cradle to grave? Really? An additional solution would be to simply boycott London-NY-Axis corporations which engage in genocide, and that includes most of the S&P War Economy and most major world corporations. Instead of the current state-of-affairs, citizens could start a new economy based on buying locally and on peer-to-peer networking. Any of the corporations which engaged in genocide need to be asset-stripped and terminated (meaning, at long last, the introduction of capital punishment for corporations) and the corporate-officials who approved the acts jailed. The western world would appear utterly doomed because of the outright stranglehold over it held by the London-NY-Axis (the English monarchy, the City of London, Wall Street and the House of Rothschild) and by Freemasonry, of which the English monarch is the worldwide patron. Putin has developed a habit of visiting Holy Mass at the Russian Orthodox Church, not necessarily to help his image but to throw his powerful weight behind encouraging young Russians to re-embrace Christianity. And Putin has definitely succeeded in boosting church attendance in Russia. When Vladimir Putin visited the Vatican on 25 Nov 2013, he even asked Pope Francis specifically about his plans for the Consecration of Russia to Our Lady in accordance with the 1917 Apparitions at Fatima but received a tepid response. It is not known whether Putin is still a Freemason, but he would at least appear to be moving in the right direction, which is much more than can be said for western puppeticians who are absolutely bought and paid for (and no doubt blackmailed too into the bargain) by the London-NY-Axis. It remains debatable whether Putin can or cannot have any major influence. It also remains debatable whether Putin is even proper opposition in the first place, or more controlled-opposition. One obvious question theologians also pose is whether the people of today actually deserve to be bailed out of the mess anymore. What if they just continued with their old ways or errors? Catholic Prophecy speaks of a Great Tribulation involving a chastisement by fire, but no one knows when. The Prophecy also speaks of Christianity thereafter being reborn in the East, “in Russia and Kiev”, to then grow much stronger than ever in all of history. But because the Catholic Church was undermined by Freemasonry on 28 Oct 1958, with the election of alleged Freemason Angelo Roncalli as Pope John XXIII, Christianity’s rebirth will probably not be Catholic but something wholly new instead. And the Catholic Church is now set to pass through the Agony in the Garden, the Via Dolorosa and the Crucifixion. Finally, Catholic Prophecy speaks of the Islamic Faithful converting “almost overnight” to Christianity but the Jewish Faithful not converting “until the end of the world”. If we put all these pieces together, it would seem that very hard times are in store for those alive today, but much better times are saved up for those born after the Great Tribulation. many, many other similar puppet agencies masquerading as “think tanks”, designed to bypass the local pretend-power or showbiz “parliament” and all taking direct orders from the Capo Di Tutti Capi within the London-NY-Axis. Welcome to the Mafia, be grateful for your “freedom” and thrilled that it is “democratic”. Those who feel angry at the thought of so much manipulation of their thoughts and minds, and of so much utter deception and deceit, may recall this Al Pacino line from the 1997 movie “The Devil’s Advocate”: “You’ve got to hold on to that fury … that’s the last thing to go … that’s the final hiding place … it’s the final fig leaf“. The right thing to do is to tell the truth and oppose what the regime requires, especially in this, their “century of change”. Nonetheless, Orwell did point out that telling the truth would become treasonous in the age of universal deceit, i.e. in this totalitarian “new world order” here and now. Already in the “free” England of around 1970, it was treasonous to criticize the monarch, for instance, by mentioning that between 470 million and 620 million human beings and counting had been genocided in its name. In England, the required thing was to worship the Beast (the English monarch) and to wave the Butcher’s Apron on Prom Night. Over the decades, the Beast visited hundreds of hospitals and pretended it was a “philanthropist” that really, really CARED about its human livestock (it really CARES, you see) and the gullible English just lapped it up. The problem is that most people who are complicit simply tag along and do the required thing willingly, instead of the right thing, and indeed they mostly followed an approach like that throughout history, with some notable exceptions. Doing the right thing is hard but, soon, there will be no other option left; because, after that, it may well be too late. Previous Post:Ancient Structures Found On Earths Moon, Proof We Are Not Alone, Nov 16, 2018, VIDEO, UFO Sighting News.